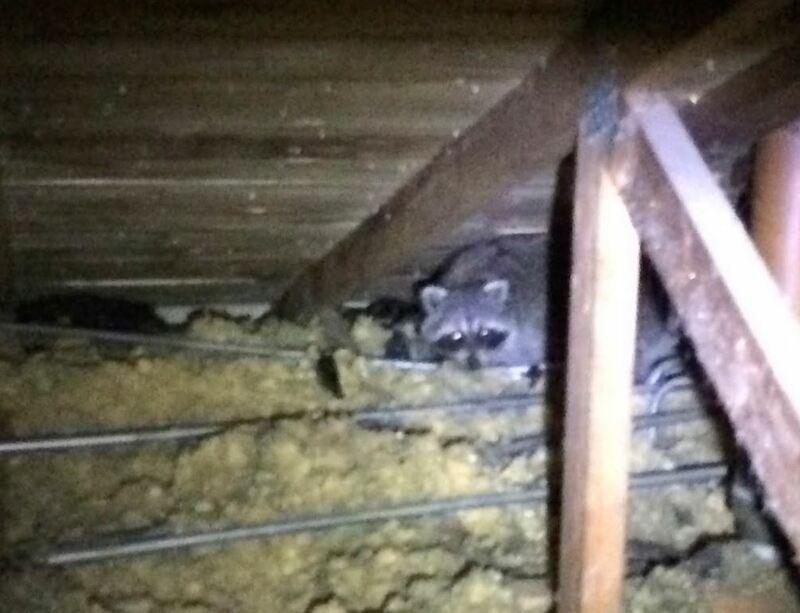 Think you may have a Raccoon problem? We at Animal Wildlife Trackers want to make the entire process of wildlife removal easy for you. 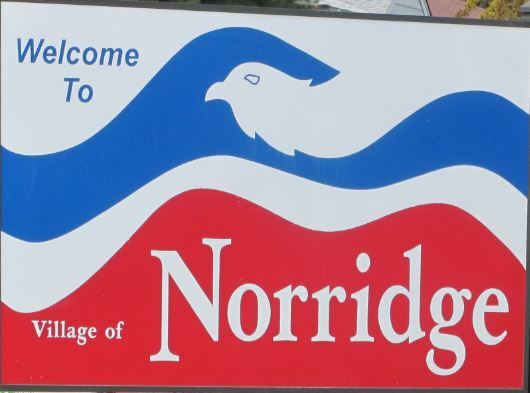 Below you will find helpful information to help you properly identify the species of wildlife you may be experiencing, as well as health or property risks commonly attributed to raccoons. Raccoons are known as the masked bandits of the animal kingdom not just because of their distinct facial markings, but also their, tendency to explore and get into trouble. 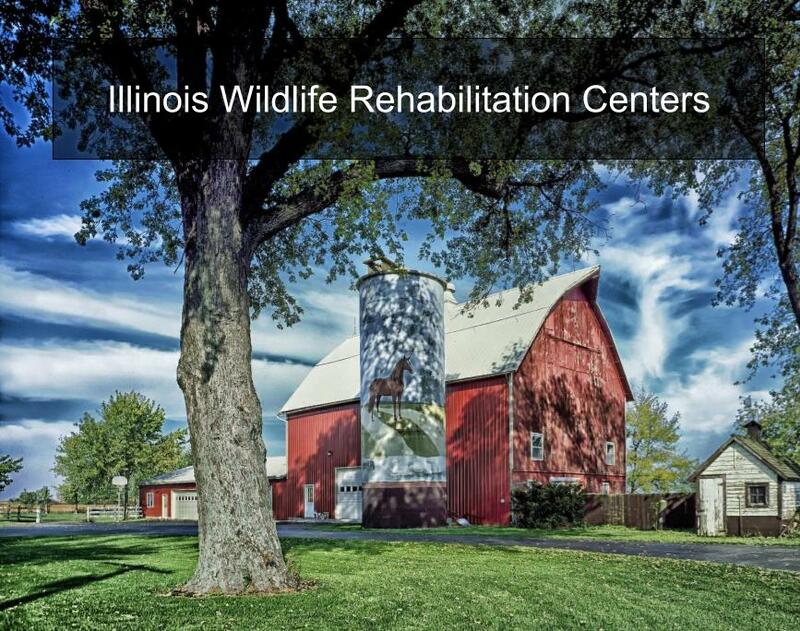 Raccoons are one of the most recognizable creatures that inhabit the Chicagoland area. Known for the black band, or “mask” around their eyes, they are, commonly gray, black, and brown in color, with a trademark striped tail. Raccoons are typically 24 to 36 inches long and can weight between 10 and 25 pounds. Their average lifespan in the wild is between 2 and 4 years. Raccoons are notorious in the Northwest Illinois area. Since raccoons are omnivorous, they will eat anything that smells good to them, whether it is in your yard, like bird food or garden plants or goodies out of the trash can. 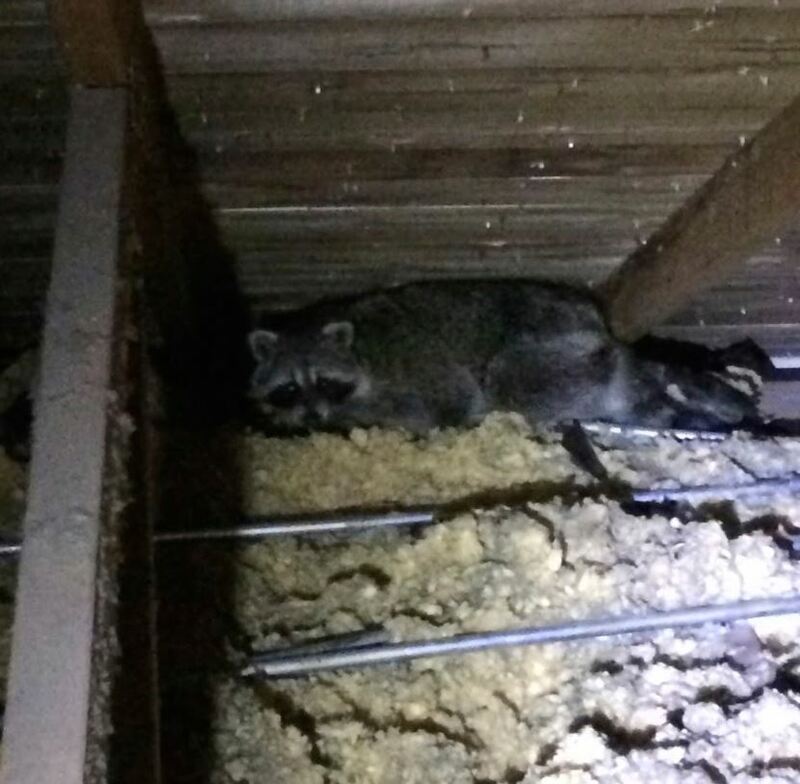 Most raccoons in the Chicagoland area are born and raised in attics, so it is natural for them to return to continue to make these places home. They can also den in sheds, garages, garbage piles and tree cavities. 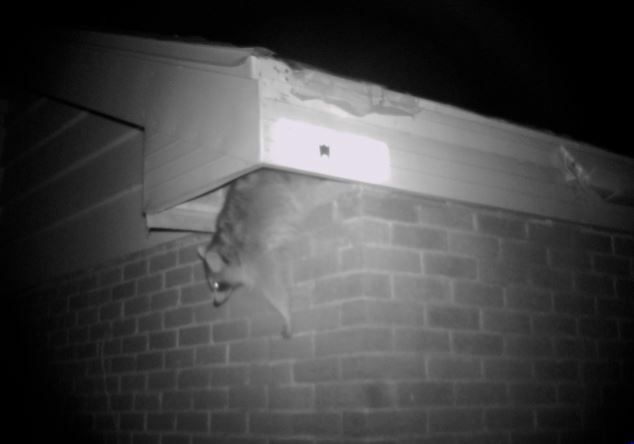 Raccoons will typically get into a home thru the roof, but can also come in at ground level. There are several common roof entry points, roof vents, and soffit vents are the most likely, but they will also just tear a hole in the roof if they can. In the Northwest suburbs, raccoons can live in the attic or crawl space year round. Therefore, if you hear a scratching or thumping sound at night in your home, have Animal Trackers Wildlife come in and investigate your home. Raccoons can be aggressive and attack when they feel like their nest is being threatened, especially during the baby season. 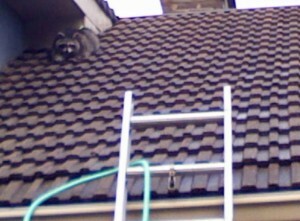 Raccoons also are notorious carriers of various diseases, especially rabies and salmonella. If you are ever bitten or attacked by a raccoon in your yard or home, seek medical attention immediately! We are highly trained and qualified professional experts in removing the animals that have invaded your home and personal space. 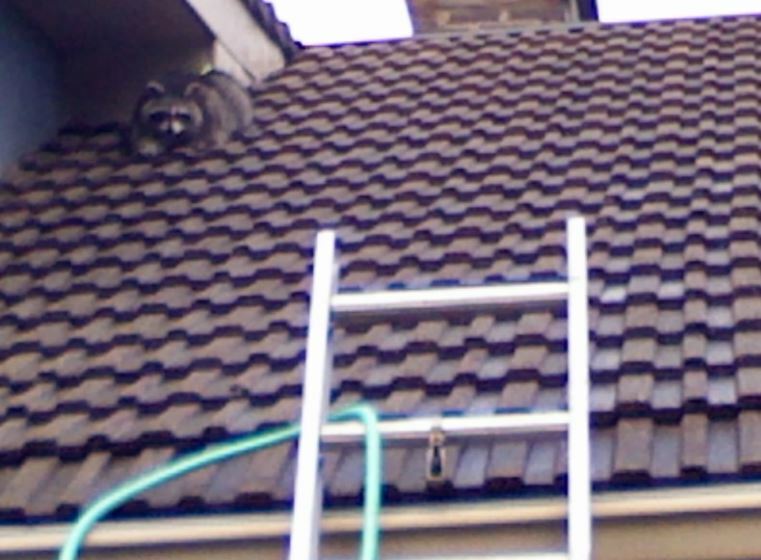 Since raccoons are highly destructive let us make your home safe from these common animals in Northwestern Illinois.